In my recent post on obscure and forgotten mystery films, I intentionally omitted any entries from mystery film series, a very popular form of crime film in the thirties and forties. I did say, however, that I would return to the subject of film series at some later time. Well, it's hot outside (and inside, my office is under the peak of the roof), vacation is looming, serious thought is even harder than usual, so here are some unserious thoughts about three of the best series from Hollywood's Golden Age. With one notable exception addressed below, all mystery series were B pictures. The term "B picture" might make one think "low budget," and most of these films were made for what passed for shoestring spending back then. But the term also refers to the function of these films in a standard film program of the day. In addition to an A picture, movie goers in the thirties and forties expected to see some combination of a newsreel, a two-reel comedy or a cartoon, a travelogue or some other informative short subject, and one or more B picture. (Because of their role in filling out a film program, B's are sometimes referred to as "programmers.") Being appetizer courses, these films were necessarily brief. The average running time was just over an hour. Series were popular with audiences because they were familiar: same stars, same music, same sets, etc. This recycling is one of the things that made them inexpensive to produce. They were popular with the studios because they gave them a place to try out new talent. So, for example, you can catch early performances of Donna Reed and Jimmy Stewart in Thin Man films, Jean Arthur in two Philo Vance entries, and Ray Milland in a Charlie Chan. All those actors would go on to win Academy Awards. Mystery series were also a place where studios could use older stars at the ends of their careers. Warner Baxter (another Academy Award winner) finished up as the Crime Doctor (ten films) and Richard Dix (Academy Award nominee) in the Whistler series (eight films). The exception to the B picture rule mentioned above was the Thin Man series, which starred the great team of William Powell and Myrna Loy. It could be argued that the first film, The Thin Man, based on the Dashiell Hammett novel of the same name, was modestly budgeted by MGM standards. 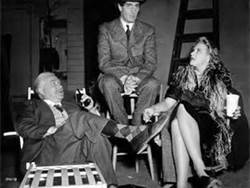 But it earned a pile of money, ensuring that subsequent films would be unquestioned A products. They appeared at long intervals for a series; only six films were made over thirteen years. The closest thing to the Thin Man phenomenon was probably the Road pictures Bob Hope and Bing Crosby made for Paramount: A picture follow-ups to an unexpected smash hit, released at irregular intervals as special event films. The Thin Man films depended heavily on the charm and chemistry of their two stars: Powell, the husband detective repeatedly pulled out of his boozy retirement, and Loy, the detective-wannabe wife who often did the pulling. They may have been the most happily married couple in Hollywood history. Early on some name confusion arose. "The Thin Man" actually refers to character from the first film whose disappearance sparks the plot. The earlier titles in the series reflect this: After the Thin Man and Another Thin Man. But soon, probably because Powell was no weightlifter, the Thin Man came to mean the character Powell played, Nick Charles, in the public's mind. Eventually, MGM gave up the fight (as Universal did when the Frankenstein monster usurped the last name of Dr. Frankenstein). 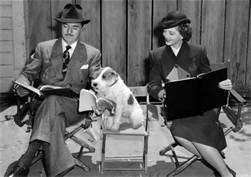 So the fifth entry is called The Thin Man Goes Home. In addition to the drinking and the leads' banter (and the participation of Asta, a fox terrier), a standard feature of the films was the denouement scene that ended each entry, in which all the suspects were brought together and Charles winged a summation of the case, hoping that someone would make a slip ("just one slip"). According to Loy, Powell complained about the pages of dialogue that he had to learn for these scenes, and the scriptwriters probably felt the same way about it. But as payoff scenes, these really pay off. The series declined gently after its great start, as the actors aged and the characters were softened (meaning they drank less). My favorite is After the Thin Man, from 1936. This updating has bothered purists ever since, but the Universal series was simply reverting to what had been the norm prior to 20th's Hound. The strange-but-true fact is that every Holmes sound film prior to 1939 had been updated to the then current period. This was true of an earlier series, Arthur Wontner's six-film effort, of Clive Brook's two films as Holmes, and of a number of one-offs by various actors. Unfortunately for the Universal series, all Sherlock Holmes theatrical films that followed it were done as period pieces, making this second Rathbone/Bruce teaming seem like an aberration. One of the things I like about PBS's Sherlock and ﻿CBS's Elementary, which were written about in this space recently by Brian Thornton, is that they again reimagine Holmes and Watson for the modern age, offering the Universal films some retrospective cover. Like the Thin Man films, the Sherlock Holmes series banked on the playing and chemistry of its two leads, who, like Powell and Loy, were good friends in real life. Basil Rathbone's Holmes, perfect in stature, profile, and voice, seems to be enjoying life in the two 20th Century Fox outings. In the Universal films, he is often serious and even somber. I'm always grateful for the occasional smile he gets from the carrying on of Nigel Bruce, though my gratitude is not universally shared. Many Sherlockians deplore Bruce's trademark buffoonery, wishing for something closer to the Watson of the stories. This wish ignores the reality that Watson's function in the series isn't the same as it had been in the stories. Here he's comic relief. With the exception of the Thin Man films, which were basically comedies with mystery relief, all the mystery series had comic relief sidekicks. Nigel Bruce was the best. The twelve Universal films only paid lip service to Doyle's stories, but they always moved along briskly. Other assets include a stock company of English bit players that almost makes you believe these were shot in England and great title music by Universal's house composer, Frank Skinner (who also scored some of their horror films). Many commentators pick The Scarlet Claw as the best of the Universal films, but my favorite is 1942's Sherlock Holmes and the Voice of Terror. I mean, if you're going to bring Holmes into the forties, he might as well be helping with the war effort. Plus this one has some strikingly noir photography and the beautiful Evelyn Ankers. It is not uncommon these days to hear the Charlie Chan films, based on the character created by Earl Derr Biggers, referred to as racist, which is sad and silly in equal measure and says more about our times than it does about this series, the longest running mystery film series of them all. There were two or three precursor films starring Asian actors as the detective, but the run really began with the casting of Swedish actor Warner Oland as a globetrotting Chan. (In one four-film stretch, Chan jumped from London to Paris to Egypt and on to Shanghai.) Oland's claims of Mongol ancestry might have been studio moonshine, though costar Keye Luke, himself Chinese, has testified that Oland wore no special makeup for the part, other than a fake goatee. But Oland's genetic makeup and his dependence upon makeup are equally beside the point, in this writer's opinion. Oland was an actor playing someone he wasn't, which is what all actors do. And he played this particular someone better than any actor before him or after him. Oland's Chan was smiling and genial, much of the time. This is one of the charges brought against it: that its geniality reflects subservience. For me, it places Chan in the long tradition of detectives who encourage their opponents to underestimate them. I always loved the moment in the Chan films when Oland would drop the smile and intone "you are murderer." This phrasing brings to mind another charge against Chan: his English isn't perfect. But I don't think Oland/Chan was ever ungrammatical. He merely dropped the occasional article and struggled with American idioms. Unless they lived in very small towns, audience members of the thirties probably knew immigrants of many ethic backgrounds who fought the same battles with English. Many had fought them themselves. Moviegoers of the period were also familiar with another part of the immigrant experience reflected in these films: the conflicts between immigrants and their Americanized children. This source of comedy relief was introduced to the series when Chan's "number one son" Lee, played by Keye Luke, debuted in Charlie Chan in Paris. After that, this series, like the earlier two I've described, profited greatly from the chemistry of its costars, in this case a Swedish pretend father and his Chinese pretend son. Oland died in harness and was replaced by Sidney Toler, who did depend on makeup and could never be accused of smiling too much. He received a new sidekick son, Jimmy Chan, played by Victor Sen Yung. A third son, Tommy, would be played by Benson Fong while Yung was in the service during the war. Around that time, Toler died and was replaced by Roland Winters. When the series sputtered to an end, there had been over forty entries and it had proven popular all over the world, including China. Since I'm picking favorites, I'll name a Chan film, 1936's Charlie Chan at the Opera. It's from the series' peak period and features Boris Karloff as the skinniest baritone in the history of grand opera. Plus they hired Oscar Levant to whip up a phony opera for the picture. How's that for attention to detail? I don't have a conclusion; I just needed another heading for balance. Someday, when it's hot again, I'll write about some of the lesser movie series. In the meantime, stay cool. Mr. Faherty: Thanks for the memories. These 90-minute mysteries amused many of us growing up in the 50s with the advent of TV. Jimmy Stewart was great as a dead man. His career curve shot up after that. Thin man was a great series. Basil Rathbone is Sherlock Holmes. There was a Charlie Chan movie I remember where people were getting shot and killed, but no bullet. Turns out the culprit was using frozen blood in his shells. At ten, I thought 'how brilliant.' Later, 'how dumb.' Lots of fun. And they got me reading mysteries. Great article. You give us info almost forgotten. Yours truly, Toe. What a fun article! I love the Thin Man series (although today I don't find the booze jokes as funny...). I agree, Powell & Loy had the best Hollywood marriage ever. I remember Jimmy Stewart - perhaps the one and only time for him? - as the villain in one of them! I never saw much Charlie Chan, but I'll keep an eye out for them on TCM. Adore Rathbone as Sherlock! I have to say I often felt like Dr. Watson just a bit behind the curve in Holmes' shadow. Bruce and Rathbone a great pairing in my opinion. This brings back memories of a childhood summer when one of the local stations played Charlie Chan movies every afternoon. I loved them and never missed Charlie Chan but would run out to play when Howdy Doody came on. I loved this column, Terry. That's great coverage of three great series. Maybe one of these days we can meet for real, and talk movies . . . Thanks for the comments, folks. Sorry I've been "off the air" recently. We were on vacation. John, if there's a Sleuthsayers rendezvous at Bouchercon, I'll try to make it. Maybe we can talk movies there. I feel a little dumb– I never gave a thought to what the B in B-films meant. For a short time, Disney brought the concept back with A-film Roger Rabbit and even featured a cartoon to go along with the, er, live-action cartoon. Speaking of cartoons, I can’t forgive the cartoon-like (Batman) treatment Robert Downey, Jr gave Sherlock Holmes. I agree Nigel Bruce played Watson as a buffoon, but Basil Rathbone created quite an interesting character. But I agree that Jeremy Brett is the epitome. I very much like old B&W mysteries. Would Mr. Moto make your B-movie list? Where did you find those on-the-set photos! They are great. Leigh, I'll include Moto, another interesting detective. As for the photos, I just lucked out. But on set photos were a common publicity device back then.